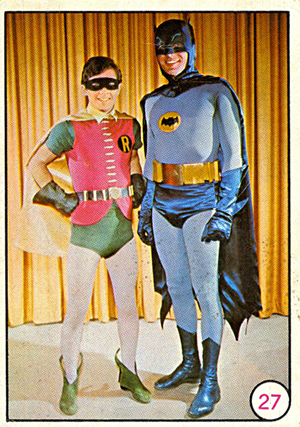 1966 Topps Batman Bat Laffs is one of two trading card sets released to feature images from the movie starring Adam West, Burt Ward and much of the cast of the campy TV show. That same year, Topps also released three other Batman sets with original artwork. The 55-card checklist has a very basic design on the front. A large photo has a thin white border. A card number is in a small white circle. Images mix promotional shots with stills from the film. Although Batman and Robin are featured heavily within the set, many of the franchise's secondary characters are also present. These include the Joker, the Penguin, the Riddler and Catwoman. Card backs have different puzzle pieces. None have captions, but many have corny joke under a Bat Laffs headline. All cards in 1966 Topps Batman Bat Laffs that have a joke come with two variations. Card backs can be found with or without, "See the BATMAN Motion Picture release by 20th Century-Fox" written above the copyright information. This site offers an extensive gallery of both the card fronts, backs and variations. 55 cards. Because cards have no captions, the checklist includes those pictured on the card fronts.